Handrails can help define pedestrian walkways that prevent them from wandering into the path of forklifts and other moving equipment. Handrails also help prevent falls from mezzanines, crossovers, platforms, dock stairs and sidewalks. Protect property from vehicular damage with clearance height warnings before entering. Hang these bright yellow poly clearance bars from the building or from a free standing apparatus. Choose standard bar with no print, or custom imprint with specific warning. Temporarily block of rack aisles up to 18 feet wide with the retractable aisle barricade to help improve worker safety. Ideal for situations where a forklift driver wants to close an aisle while he loads or unloads a pallet or when a pedestrian needs to pick products and wants to warn forklift drivers of their presence. Quickly create temporary safety zones with these portable barricade systems that roll to your location, set up in minutes and helps protect workers from accidents while working. 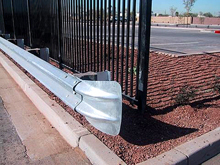 Protect structures and limit vehicle access with W-rail guard rail that offers sturdy protection against impact at low speeds. Highway guard rail gives drivers visual cues as to vehicle lanes, prohibited areas, and access points. Not rated for public roads. Jersey Barrier Portable Barricades provide the perfect temporary traffic control for construction projects, special events and long-term security perimeters. Easy to set up, easy to relocate, and much less expensive than concrete. Help prevent vehicles from going beyond assigned parking spots with polypropylene parking blocks that are durable, strong and easy to install. Make parking lots more organized and less accident prone while parking. Speed bumps and speed humps help slow vehicular traffic in and around your facility. Speed bumps cause traffic to slow to a near stop, while speed humps allow traffic flow to continue though at a significantly slower speed.